Today I have a beer that was brought back from Australia for me by a friend. 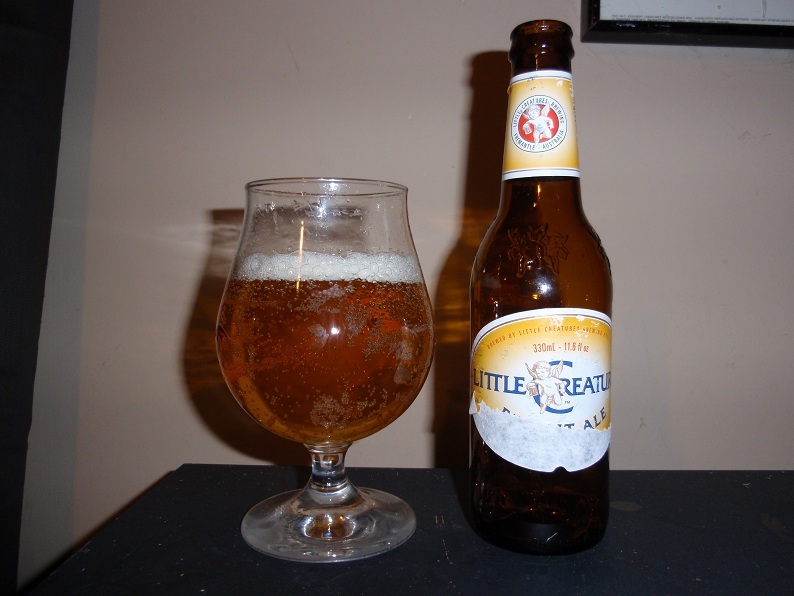 I have been excited to try the brews of Little Creatures since I first hear of them about a year ago while talking beer with the significant other of a family friend that was in town from Australia. I don’t know a ton about the brewery, but they are one of the few breweries out of Australia producing progressive craft beer and I can’t wait to get a taste. Pours a bright golden hue that is completelyÂ translucent. Just over a finger of white head is produced and stays for a minute or so. Smells of pale malts, soft grain sweetness and light bitterness. Tastes of clean Pilsner malt, enjoyable grain sweetness, soft bitterness, mild lemon, grapefruit and other fruit esters. Overall this is a very drinkable, light ale that is incredibly tasty and brilliantlyÂ quaff able. If this were in my market I would drink it on the regular and at 4.5% ABV it would be no problem. Nice grain flavors and enough hops to make this beer far from bland. A perfect session beer. As I continue to drink Â gentle notes of caramel, soft herbal esters and a slightlyÂ creaminess is present giving this smooth beer plenty of character. Body is light and the mouthfeel is very clean. A truly delicious brew that I can’t say enough good things about. If only it weren’t so easy to drink I may have been able to savor it for longer. Perhaps one of these days I can brew such a delicious, moderate ABV brew. If you ever make it to an area where Little Creatures is available I would highlyÂ recommendedÂ this brew and ask that you ship me a few cases while you’re at it. Give it a shot and ride your bike.